Don’t you just love boxing nicknames? Deontay Wilder v Tyson Fury AKA ‘The Bronze Bomber’ v ‘The Gypsy King’ is almost upon us. For once, it’s a high profile fight in the USA which isn’t in Las Vegas. Instead, the Staples Centre in Los Angeles will take a break from NBA duties (the Lakers and Clippers both play there) to host the WBC Heavyweight Championship of the World, this Sunday afternoon New Zealand time. With Anthony Joshua well positioned as the clean cut, good guy of the division, these two are different. For example, Wilder has been arrested for domestic violence and marijuana possession. Fury has had his drug, booze and mental health issues and has offended plenty of people over the years with his controversial views and beliefs. Wilder, 32, has been WBC Champion since 2015. Fury also became World Champion that year when he beat Wladamir Klitschko to win the WBA, IBF, WBO & IBO belts. Both men have perfect professional records, Wilder with 40 wins, 30 year old Fury with 27. After defeating Klitschko in Germany, Fury never defended his titles, instead descending into battles against depression, drug abuse and alcoholism. The IBF title was taken away from him and he vacated the others with his licence to box also being suspended. After piling on the pounds (over 100 of them) he made his comeback this year with two fights against (below) average opposition. At the same time as chaos engulfed Fury, Wilder has slowly amassed five successful defences, but this fight is undoubtedly his biggest challenge to date. The clash of styles should mean a cracking encounter. Wilder has the power which has assisted 39 knockouts. He’s got speed, an awkward style, is happy to get in a brawl to get the job done. Fury has quick feet, can slips punches, switch easily between orthodox and southpaw and can stop opponents too; he might not have the booming right hand Wilder does, but he’s got 19 knockouts to his name. As usual with the big fights, the hype machine has been ramping up. Both men are big personalities, loud, obnoxious. 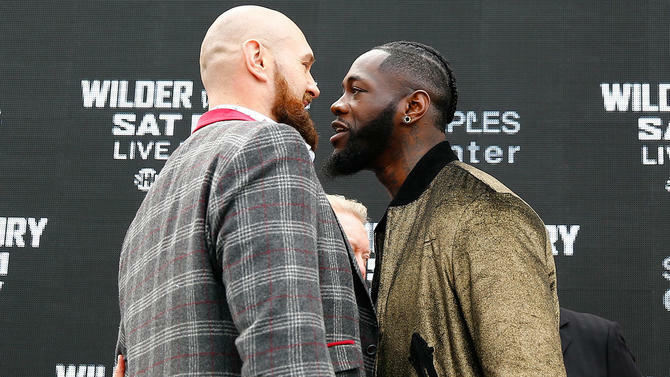 Wilder has laid out a mascot while Fury has laid bare his struggles, while emphasising his renewed love for life. With Joshua lying in wait, this fight will have big repercussions, the winner likely to meet him in a unification match, with the loser probably falling into the Joseph Parker where-to-next trap. If this was early 2016, I’d take Fury on the back of that Klitschko win, no doubt. The things his body and mind have been through since however, cast a fair amount of doubt. Wilder is underrated in my opinion. You don’t go 40-0 by accident and if he connects with the big right, it could all be over in a flash. But that said, Fury has the style to counter that – if you haven’t seen it, try and watch him against Klitschko – it was impressive. From a distance Fury seems mentally freshened, fit and I think he wins on points. For a while now, Joshua has been the main heavyweight course, but as starters go, this should fill you up for the next six months or so. Enjoy the fight.